Analog Artist Digital World: Twisted Tuesday at the Red Lion Pub. Twisted Tuesday is a weekly event every Tuesday held at the Red Lion Pub (3784 Howell Branch Rd, Winter Park, Florida). It features a free home-cooked meal every Tuesday but of course donations are greatly appreciated. Rahoe Productions and Representation provides Live Music from 7:30pm-10:30pm every Tuesday and the Red Lion Pub provides a DJ thereafter alongside a friendly environment to showcase talents such as hula-hooping, fire-arts, LED-arts, juggling, stilt-walking and much more. I went to the Red Lion Pub in December to meet Andy Matchett who wanted to buy a print for the holidays. He was at the end of the bar when I arrived. He had pulled together a successful Kickstarter to create vinyl albums of the soundtrack to his very successful Fringe play, The Key of E. He wrote all the music for this apocalyptic rock musical. All though there was enough money raised to cut the albums, he still needs more money for the packaging. 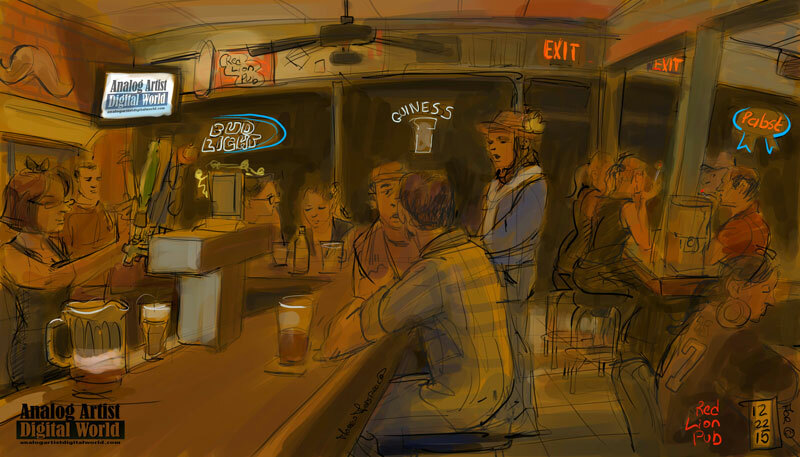 When Andy left, I took his bar stool and sketched down the length of the bar. There was free food by the front windows, but unfortunately I had already eaten. I ordered a beer from the tap that looked like a fish. Rosmarie Ryan the pub's owner looked over my shoulder and rather liked the sketch. She offered me another beer which I gladly accepted from her daughter, Mikayla, working the taps. The place gradually got more crowded as the evening progressed. Outside, someone was playing an old upright piano with its innards exposed. Vendors had blankets set up to sell crystals and some local art. I chatted with a fellow that called himself, Dali Lama, about art for a while. I want to return here some Twisted Tuesday to sketch the fire spinners and hula hoopers in the parking lot. I need to arrive later which is when these activities heat up. There is a warm inviting atmosphere to the pub, like these people get to reunite every Tuesday. When I got home, Terry told me to take off my clothes and take a shower. I'm lucky in that I have a weak sense of smell, but apparently I reeked of cigarette smoke. Even my skin sponged up the smell. Next time I sketch at Twisted Tuesdays, I'll spend far more time outside where there is plenty of vibrant local culture and a breeze.